J.S. Bach’s Goldberg Variations were rendered indelible for a generation by the recordings of pianist Glenn Gould, for whom this supremely intellectual composition became a sort of emblem signifying the genius of the individual performer. For those steeped in the Gould tradition of the Goldbergs, and even for fans of some of the many more recent keyboard interpretations — such as the equally great if very different versions offered by Murray Perahia and Simone Dinnerstein — these 33 miniature masterpieces are hard to imagine apart from the sound of the piano. Yet despite a permanent and wholly appropriate association with keyboard instruments (the Goldbergs were originally composed by Bach for harpsichord), they have over the years attracted a wide variety of transcriptions, ranging from late-19th- and early-20th-century versions for two pianos or one piano, four hands, to late-20th-century covers for jazz trio or even synthesizer. On Friday night at Hahn Hall, the principal string players of the Camerata Pacifica — Catherine Leonard, violin; Richard Yongjae O’Neill, viola; and Ani Aznavoorian, cello — delivered a sparkling, radiant, and thoroughly convincing account of this extraordinarily challenging work in a transcription for string trio written by the Russian violinist Dimitry Sitkovetsky in 1984 and dedicated to Glenn Gould. The performance, as was announced from the stage by Aznavoorian, was dedicated to a recently deceased friend and subscriber to the Camerata Pacifica, Anton Boss. For an hour, regular time was suspended, and all ears were tuned to the seemingly infinite set of variations Bach was able to create based on just 32 bars of bass. Whether you call it a chacona, a lamento, or simply a bass line, the entire piece is anchored by a single harmonic progression that Bach weaves and reweaves into a dazzling array of forms, each more perfect than the last. The mathematical ingenuity of the piece is legend — there are enough symmetries, inversions, arithmetic progressions, and numerical patterns in the Goldberg Variations to keep a team of musicologists busy for years. Yet it’s not necessary to understand the piece to enjoy it. As with much of Bach, the rhythmic flair and quicksilver fluidity is enough to draw the listener in, and the dark sonorities of the minor key variations are enough to make one sigh or even sob. In this version, many things that are less than obvious in a keyboard rendition came out clearly — the strutting cadences of the dance sections, the tug and pull of the leader and the follower in the canons, and the singing clarity of the crescendos all made more of an impact when heard as the work of three distinct voices. The demands on both players and listeners may have been considerable, but the results made it all worthwhile. An enthusiastic crowd gave the ensemble a standing ovation when the hour of music was over, and returned to stand once more after the second half of the evening, which was given over to the Piano Quartet in A Major, Op. 30 of the French Romantic composer Ernest Chausson. Influenced by Wagner, Franck, and Brahms, Chausson’s work captures a feeling of yearning and a mood of elegant abandon that perfectly complements the highly structured world of Bach. The ensemble was outstanding throughout, with Aznavoorian providing an exceptionally vivid and dynamic presence on the cello and Richard O’Neill soaring mightily on viola. Of course none of this splendid and rare music-making would be possible without a violinist of great tact, delicacy, and courage, all of which Catherine Leonard brings to the group along with her undeniable technical virtuosity. 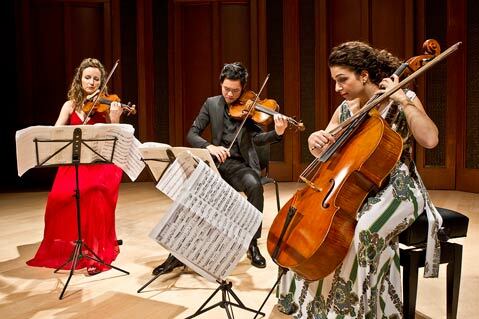 Only a very few chamber music organizations in the world are capable of putting on a program of this high quality and depth, and we are fortunate to have the Camerata Pacifica here at such a moment in their development as a group.